Our ability to park is gradually being dumbed down by new technology that is appearing on cars even at the budget end of the price range. 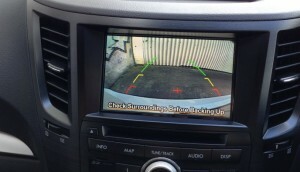 Sensors in the bumpers, both front and rear, warn of hidden obstacles either with an audible tone or on a screen; reversing cameras show you things you can’t necessarily see out of the rear window; and automated parking systems will complete a whole parking manoeuvre for you (most frequently parallel parking, but Holden’s Commodore will also do a reverse right-angle [perpendicular] park). Cars without that technology would be more difficult to park than cars of 30 years ago because modern design and safety requirements means they have thicker rear pillars, smaller rear windows, and higher shoulder lines, all of which obscure what’s directly behind you. 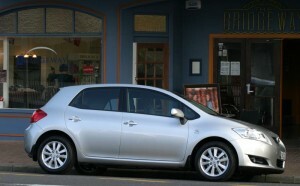 Angle parking is parking arranged at an angle to the kerb or wall. It’s called echelon parking in the UK. It allows for easier entry to the parking space, and narrower parking spaces meaning that you can fit more spaces. They also are used where the road might not be wide enough for perpendicular parking, but parallel parking is too wasteful. In New Zealand all angle parking is nose-in – i.e. you drive your car forwards into the parking space. In some overseas cities where there are steep hills, some parking is back-in (on the downhill) as this is less dangerous exiting the parking space. Cyclist organisations don’t like angle parking because it’s difficult to see up the road when reversing out of the parking space, and that puts cyclists in danger. 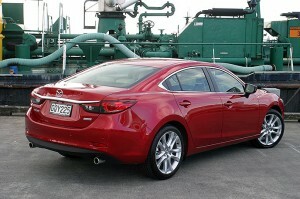 Vehicles with reversing cameras can see, and some cars, such as the Mazda6 LTD (pictured), have Rear Cross Traffic Alert, which scans up the road as you reverse out of a parking space, looking for approaching vehicles. If you are angle parking next to a wall, be careful not to run the corner of your vehicle into the wall if there are no barriers to stop your tyres. On a street, the kerb will stop your tyres, but a low car may still suffer damage to the front splitter/bumper. 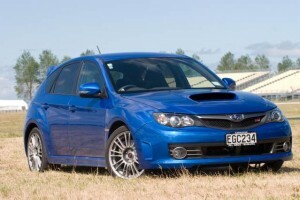 You can see on this blue WRX STI that the front splitter (the bottom of the bumper) is quite low, and some kerbs will be higher than that. Perpendicular parking is at a right-angle (90 degrees) to the kerb or wall. A tighter manoeuvre into the space is able to be performed by backing in, but this is trickier as it requires you use your side mirrors to judge the position of the other vehicles in relation to yours. How not to park in a perpendicular parking space. 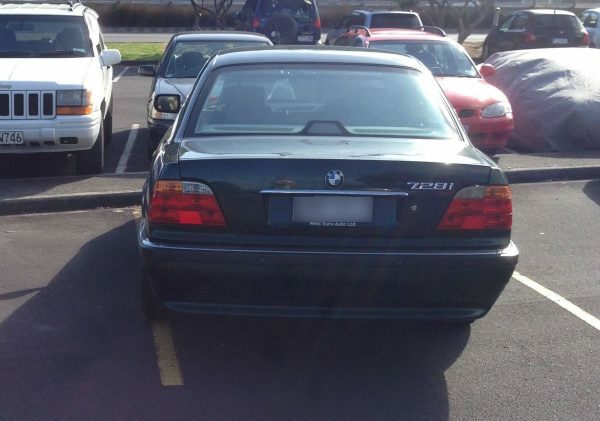 Your car should be evenly spaced between the lines, not on or over the lines like this BMW. Being able to back in, though, does mean that you can create greater room for you (and your parking neighbour) to get in and out of the car. For example, if there’s a space between two cars that have parked nose-in, you can reverse in closer to the car on the right. Your passenger door will then be close to the passenger door on the right car, and your driver’s door will be next to the driver’s door on the left car. The driver of the right car can always reverse out before letting a passenger into their car; the driver of the left car (and you) have slightly more space to open your drivers’ doors. In some Australian towns and cities you might find a row of perpendicular parks in the middle of the road where you pull into the parking space from one side of the road and drive out forwards the other side. We know of people that refuse to parallel park between two cars, because it’s daunting. They will drive around until they either find two spaces in a row, or an angle or perpendicular park. However, parallel parking is quite easy if you know how, and you don’t need to scratch up your alloy wheels. You should park within 300mm from the kerb. This video from A1 Driving School shows you exactly how. To get good at parallel parking, you have to practice, and you can do this using a couple of cones in a deserted car park on a weekend. If you still think that parallel parking a car is tricky, how about this video of parallel parking a truck! In cities where parking space is at a premium then you might find automated stackers which whisk your car away to be parked efficiently by a computerised system. You don’t have to spend ages driving up a multi-storey car park looking for a space, and when you return, the system retrieves your car for you in less time than it would take you to find your car and drive it out yourself. This video gives an example of one in Germany. If you are in Auckland you can experience one yourself in the Ironbank building on Karangahape Rd. Autonomous parking is where your car will park itself without you in it, and it’s being developed by Ford and others. While automated parking garages keep your car safer from other drivers who might bang their door into your car, autonomous parking doesn’t. You simply get out of your car and it will complete the parking manoeuvre for you. When you come back to the car, it will move out of the space so that you can get back into your car. Check out this article for a detailed description of hill starts. The handbrake is the first line of resistance when parking on a slope. It will hold the rear wheels. However, if the mechanisms are hot, as they cool they can contract slightly and this can cause the handbrake’s grip to weaken, allowing the vehicle to roll forwards. Therefore putting the car in reverse gear if you are on a downhill slope, or first gear, if you are on an uphill slope, is the second line of defence in a manual vehicle and will provide a lot of resistance as the engine will not want to turn over backwards. You can put an automatic car in P (Park) – don’t put an automatic car in P without also backing it up with the handbrake or you can damage the transmission. If those fail, angling your wheels towards the kerb will mean that as the vehicle starts to slowly roll forward it will turn towards the kerb and will be stopped by it. ‹ Are reversing cameras any good?